Zwischendrin.com ([ˈʦvɪʃnˌdʀɪn], german for "in between") is a portal for CG artists where they can get affordable HDR panoramas for nearly any situation. Not only panoramas, though - but also high-resolution textures, backplates, sounds, videos and even motion capturing data. Our HDRIs are not only "green grass, blue sky, direct sunlight" HDRIs but HDRIs for bad weather, underwater, in the sky, on the branch of a tree, HDR timelapses... simply for every imaginable situation. A special highlight are the so-called ScenePacks. Those packages are a cut out of nature and consist of at least one 360° HDRI and the corresponding sounds and backplates. Additionally, there may be textures and videos included as well. ScenePacks open up the possibility for CG Artist to not only render "simple stills", but to transform them into animations with relatively little effort. They reproduce a piece of reality and are excellent for special effects and bring life to any 3D scene. We came up with some things that showcase our products in a way so that you know what to expect from them when you decide to buy one or more. Because — what's the point in buying an HDRI panorama if you just know how the scene looks but not what kind of light it can produce? What are sounds or motion capturing data good for, if you can't listen to them or see them in action? We show you on zwischendrin.com what you can expect from our products! On the detail pages of our HDRIs, you can rotate the panorama around a test scene with the help of a slider bar. 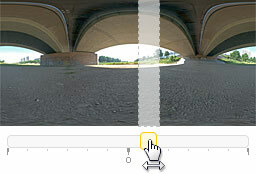 That way, you can easily see which lighting possibilities the corresponding HDRI panorama offers. The different material of the test objects (we call them "scene Joes") reflect the versatile fields of application by demonstrating the influence of the ambient HDRI on gloss paint, metal, glass and plastic material. The sockets of the scene Joes consist of a material similar to plaster, to illustrate a "neutral" material, shadows and caustics. Below this sliders you find some useful information like resolution or exact recording location of the HDRI, including a link to GoogleMaps™. On the detail page of textures or images, ScenePacks and Panorama Packs, there is a magnifier function to zoom in into the image. This helps you to recognize even the smallest detail and to evaluate the overall image quality. The preview does include a watermark, but that shouldn't have any negative influence on your impression of the image. 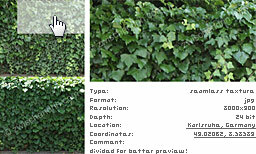 Below the zoom view, you'll find more detail about the corresponding image, like resolution, depth or recording location. Our sounds can be listened to on the detail page as well as on the overview page. Although playback is limited to an ordinary stereo MP3 quality, but neither that nor the audible audio watermark to prevent illegal use of the audio files should mar the preview quality of our ambience sounds and sound effects too much. Same as with our HDRI panoramas and images, you'll find additional interesting information on the corresponding overview or detail page. When it comes to our Motion Capturings, our biped friend "Joe" demonstrates how the movements look when applied to a character. The MoCaps are processed and rendered with 3D Studio Max and can be previewed in their full length. We offer the formats c3d and bvh, supported by most of the common apps. Our direct contact to a company creating individual motion capturings makes it possible for us to accept commissional work and thus to record and adapt motions at your desire. We do also have type-independent features like our tag system, which can be extended by the community. You find it at the bottom of each detail page. If you like one of the renderings rotating in our slideshow on this page you can simply navigate to the corresponding product by clicking on the image. If you want to know about the latest products you can subscribe to our RSS feed. We do also offer a big FAQ section to answer most frequently asked questions - nevertheless you can just use the support link at the bottom of each page to get an answer to your question. For those who like to grab the camera themselves or to program scripts/plugins, we have created an extra scout system, which makes it possible to sell your own products on zwischendrin.com. Now it is time to browse our HDRIs, high resolution textures, sounds, motion capturings and scripts/plugins. You can buy them directly online, but we even offer some of our products as a completely free download. Have fun!